Andrew Rogers is a Sydney-based entrepreneur that has lived to tell the tale of the dot-com era. His startup, Anchor, is one of Australia’s top web host service providers and now they’re going global. 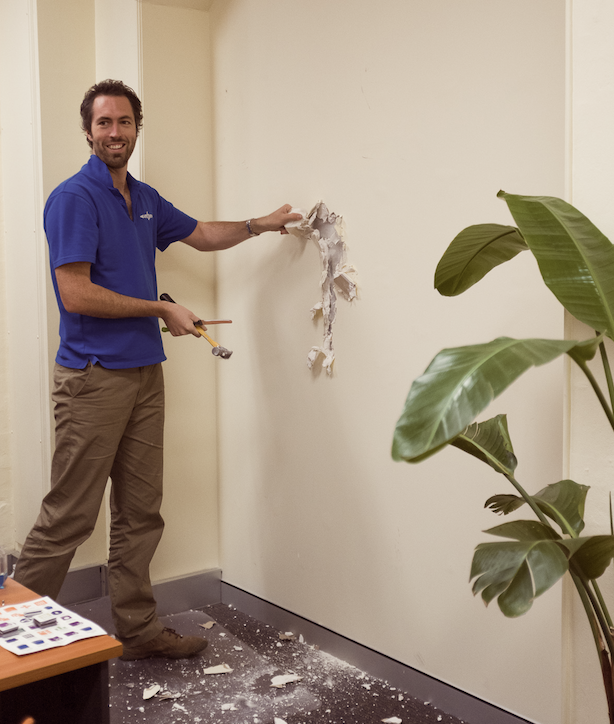 Here’s a snap of Andrew literally knocking down office walls to increase team collaboration. You started your host company Anchor Systems in 2000, what was the web industry like then? Any shareable memories from the dot-com days? We planned to get into hosting whilst the dot-com was going crazy and then it all fell over about the time we started. There weren’t really any hosting companies to speak of so we looked at the ISPs who were being valued at thousands per customer and decided we’d have a million dollar business in no time. I hear stories from other people that worked in big companies in the dot-com era about the parties – we missed all that because we were chained to our desks 18 hours a day getting a bootstrapped startup off the ground. I remember eating pizza six nights a week at my desk for way too long. You announced green web hosting services in 2011 – what’s the response been like? What do you envision data centers of the future to be like? We actually launched it as a paid option a couple of years prior and the response was pretty much non existent. We probably didn’t market it heavily enough but yeah – a few passionate customers bought but that was it. Our industry uses a huge amount of power – we constantly use the equivalent of well over 100 households and we represent less than 1% of the space in one of the data centers we operate from. In 2011 we decided we’d just pay for the green power ourselves and give all of our clients green hosting automatically. It was important to us so it was just something we decided to do ourselves in the end. We’ve done a fair bit of work to reduce power consumption and over a period in which we’ve more than doubled the size of the business we’ve reduced our total power consumption. Unlike the green power we did this at a net cost benefit to the business, it has saved us a lot of money. Data centers are full of computers – these are the bits that change rapidly and have short lives so in the near future this is where I think all the change will occur. Surprisingly the industry feels like it’s been slow to move in this direction so there’s a lot of opportunity. The buildings take a long time to build and recover costs and are very hard to change so I think the evolution will be much slower in this area. We used to spend a lot of time in the data center upgrading and tweaking machines. These days we spec them up, turn them on and then everything happens remotely – mostly due to virtualization. You’ve been working on a new tool called BuiltWith – what is it? BuiltWith is very exciting. We track the technologies (think content management systems, advertising platforms, shopping cards, analytic tools) on 100 million of the busiest sites on the internet. When then turn this into a big data set and make it useful. For any website we can instantly tell you what it uses – at Anchor we’re often asking our clients if they use WordPress or do they have Google Analytics and a lot of the time the businesses just don’t know – with BuiltWith we don’t need to ask the question. The other thing we do is sell lists. We can compile lists of all the sites using say Magento – or any technology a company is interested in – such a list of their competitors customers. This has been the exciting bit because it’s helped some great startups like Optimizely grow and has brought on big clients like Google, Microsoft, eBay and Twitter. What’s your ethos around building a cool company culture at Anchor? There’s one really simple premise – recognize that there are things that make work fun for me and then try and ensure everyone has similar such things in their job. It’s just about looking after people. The environment is one part of it – flexible hours, an open account at the coffee shop, everyone chooses their workstation setup, comfy chairs. But the work and skills development probably more important – providing interesting projects to work on, employing and developing great managers, giving people the chance to move around and develop new skills. You’re a mentor at Startmate and have supported community conferences like SydStart – do you feel you had the same level of assistance when starting your company? I had a few relatives with businesses that I’d call for advice – they worked with wardrobes, airports and export grants. So it was a bit different but we still had help, advice and mentors – people who had started business and most importantly would listen to our challenges. I’m really excited about things like Sydstart, Startmate and Pushstart as they’re all great opportunities to repay that debt that I owe other people who helped us get started. What Australia startups are you keeping your eye on? It’s hard because it’s easy to be biased towards the ones you know more about. I’ve seen BugCrowd executing amazingly from the start of this year and I think Kinderloop have a chance of owning their space. I really love the Airtasker service so I’m super keen to see them succeed so I can keep using it. What community meetups and industry events do you recommend our readers check out? It’s not one regular thing anymore for me, just keep hunting out the quality events and people, be prepared to take timeout from work to discover something new – set aside time for an event each week – it’s the only way to stumble on the good experiences. What are you favorite suburbs in Sydney? Not quite suburbs but the amazing parks that always feel so empty considering we have millions of people in our city. The headlands around Balmoral/Mosman, Botanic Gardens, the Spit to Manly walk and Centennial Park. About our contributor // Kate Kendall is the founder and CEO of The Fetch. She regularly blogs about startup life and advises businesses on the role of marketing and community. Follow her on Twitter via @katekendall.